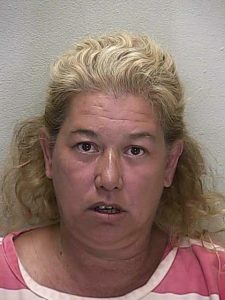 Ocklawaha, Florida — The Ocklawaha woman who killed her husband back in September of 2012 has plead guilty and faces up to 30 years in prison. The Marion County Communication Center received a 911 call on September 22, 2012, around 12:08 a.m. from Sherry Wilson Lewis, 50, of 3715 SE 174th Court in Ocklawaha, who stated her husband, Daniel James Lewis, 53, had been stabbed. According to the Marion County Sheriff’s Office, a deputy arrived at the residence and made contact with Lewis. She told the deputy that her husband was in the bathroom. Once the deputy entered the residence he observed large amounts of blood in the laundry room, the hall extending from the laundry room to the bathroom, and in the bathroom where the victim was lying on the floor. There was a black handled filet type knife on the bathroom floor with blood on it. The deputy picked it up and placed it in the bath tub, according to reports. The deputy then secured Lewis in the back of his patrol car and returned to the victim who by then had lost consciousness. He was air lifted to Shands Hospital where he died as a result of the five stab wounds he received. He had three stab wounds to his upper left arm, one stab wound to the upper back, and one stab wound to the upper chest. When authorities tried to interview Lewis, she stated, “I know what I did,” then invoked her Miranda Rights and refused to give any further statements. A witness told authorities that on September 21, 2012, Lewis arrived at a family gathering intoxicated, and while she was there also consumed an entire bottle of wine and several beers. According to the witness, Lewis became verbally abusive toward family members, making comments such as, “I hate this [expletive] family,” and even threw beer cans at them. Lewis’ daughter Monica Howard, told investigators that she had witnessed her mother being physically abusive to her husband in the past. She plead guilty Tuesday, September 24, 2013, after signing a plea agreement that could give her a maximum sentence of 30 years in prison. The next court date set for Lewis is October 18, 2013, at which time she will find out exactly how long she will spend behind bars for her charge of Second Degree Murder (Domestic). Circuit Judge Hale Stancil will have the final say in Lewis’ sentence.